If you’re already a certified Open Water Diver, this Advanced Open Water Diver course in the Andamans is your key to a more intense world of diving. From this level onwards, each dive focuses on a specific diving speciality. You'll be able to try out each and decide which one you enjoy most. At this level, you don't require any more theory learning; just a short briefing about each dive site, and the rest of your time will be in the water. During the Advanced Open Water Diver course, you dive to a maximum of 98 feet, with in-water lessons to understand dive theory, planning, and techniques. You will have two compulsory dives: an Underwater Navigation dive and a Deep Dive. Apart from those, you can choose 3 other dives from 15 dive types such as Naturalist Dive, Buoyancy Dive, Wreck Dive, Night Dive, and more. At the end of your training, you will be certified as a PADI Advanced Open Water Diver. NOTE: Only divers who have completed the Open Water Diver certification can apply for this level. Havelock Island is a 2-hour ferry ride away from Port Blair, in the middle of the Andaman Sea. The ocean here is home to some of the highest counts of fish and coral species on the planet. Apart from a number of spectacular dive sites, you will also find white sand beaches, swaying coconut trees, and a relaxed island vibe in Havelock. It's the perfect spot to earn your Advanced Open Water Diver certification. • Ean your PADI Advanced Open Water Diver in the Andamans. • Dive to a maximum depth of 98 feet or 30 metres. 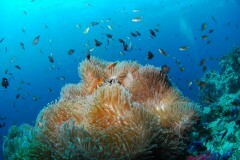 • Do 5 thrilling dives in the Andaman Sea. • Choose from Underwater Navigation, Deep Dive, Night Dive, Underwater Photography, and many more speciality dives. Please allow 24 hours between your diving sessions and your return flight. You will need time for your body to recover before boarding a flight. If you have suffered from any recent illnesses, please inform the instructor before the Advanced Open Water Diver course begins. If you are under the influence of drugs or alcohol, the instructor will refuse to let you participate in the dive sessions. There will be no refunds in this case. For cancellations made 30 days or more before departure of the Andaman scuba trip: Full refund will be given. For cancellatios made 29-16 days before departure of the Andaman scuba trip: 50% refund will be given. For cancellations made less than 15 days before departure of the Andaman scuba trip: No refund. Divers will receive a medical questionnaire after confirmation of the booking. If the answer to any of the questions is YES, you will be required to provide documented doctor's clearance for scuba diving in the Andamans. This trip does not include meals, but you can order a la carte at Full Moon cafe, the resort restaurant or any other local restaurants. Plan your flights to and from Port Blair to land before noon, and to depart after 13:00 hrs on the last day. This way you can make the most of your stay and of your Advanced Open Water Diver course in the Andamans. Arrive at your dive centre in Havelock by 07:00 hrs. You will meet your instructor at the dive center and receive a short briefing regarding the day's dives. After an initial assessment of your diving skills, you will head out to start your diving sessions. You will complete an Underwater Navigation dive followed by another dive of your choice from the 15 types of dives offered to you. You'll be served water, fruit and snacks on the boat, and will enjoy a day on the sea. By lunch time, you'll return to the dive centre. After updating your dive book, you'll be done with the day's scuba activities. The rest of the day is yours to spend at leisure. It's going to be a fun day today, with 3 dives scheduled for the day. You'll start with a Deep dive, that takes you as deep as 98 feet. You'll take a break after that, eat some snacks and fruit, and enjoy some time on the boat. You'll complete 2 more dives in the second half of the day. By lunch time, you'll return to the dive centre. You'll fill out the necessary paperwork here, and it's done. You're a certified Advanced Open Water Diver! Your scuba course ends here. • Please carry specific, personal or prescribed medication and a personal first-aid kit.